I’m in the cab at the moment headed into Manhattan and just wanted to pop in quickly to share an update and amazing discount. The windows are down, and it’s the first time that I’ve really felt fall in the air. That nice cool, crisp breeze that makes you want to reach for a spicy, warm latte, your coziest sweater, and a favorite book. I have some tall boots in my luggage, and I’m pretty excited about getting into layers season. I had an amazing idea for a new dessert recipe that came to me while I was eating something at a restaurant in Charlotte this past weekend. More to come on that. I apologize for not having more recipes recently but I haven’t had any good ones queued up, and I’ve been traveling so much that it’s been a challenge to cook. Anywho, as you guys know I love my paper planner. It’s the LifePlanner by Erin Condren, and I’ve been using it for years. I’ve rarely seen discounts on the LifePlanner because it has such a cult following, but I wanted to share one that’s out at the moment. Erin Condren is d0ing a Friends and Family discount through Monday, September 26, 2016. 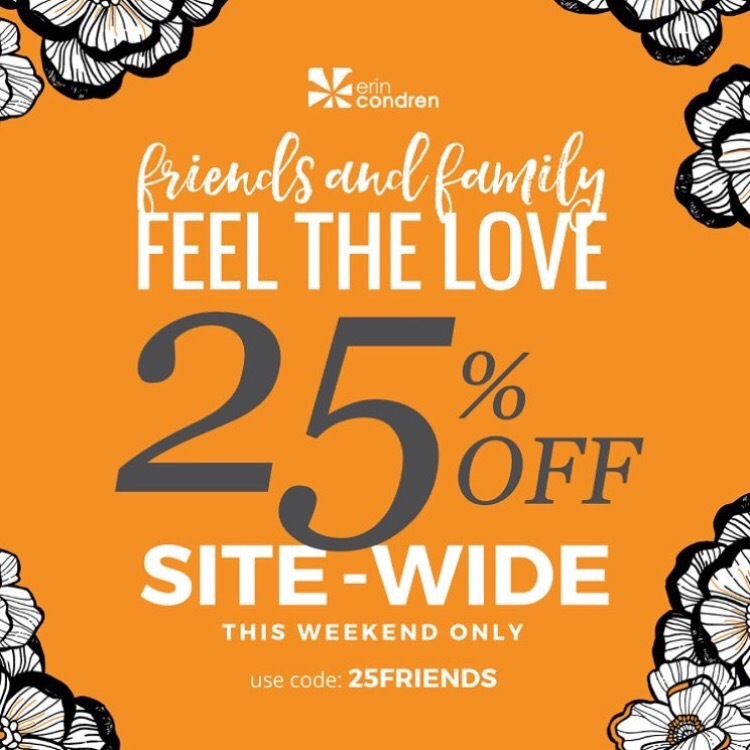 Use code 25FRIENDS to save 25% off your whole order! I went shopping this weekend and picked out my 2017 planner, as well as some extra goodies. And I was able to purchase everything thanks to your support by using my referral code. Thank you!!! Speaking of referral link, I’m not sure if you can combine it with the 25% off discount above, but if you want to try it click here for my referral link. If you use this, we’ll both get a little discount on our Erin Condren orders. Whoop! As for additional updates, I’m happy with the progress I’m making towards getting The Chic Life caught up. I miss blogging more real time, and I’m hoping to get back to doing that soon. Thanks for your patience.